Nitrogen is a dry, inert gas which is used in a wide range of applications where oxygen may be harmful to the product or processes. Nitrogen generators use regular compressed air to deliver a continuous supply of high purity nitrogen – offering a cost effective and reliable alternative to the use of cylinder or liquid nitrogen across a wide range of applications. 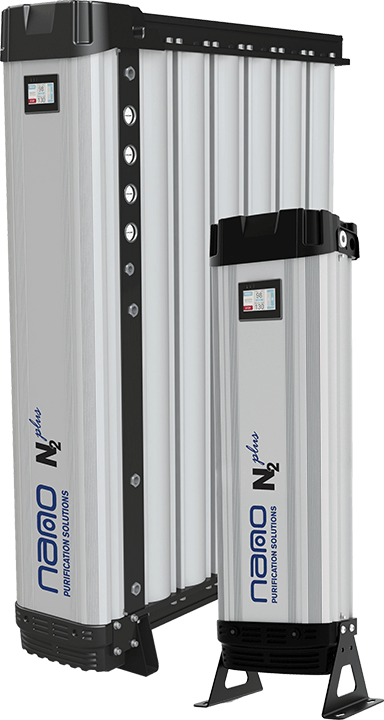 The advanced nano N2 range of nitrogen generators use integrated Adsorbent Media Tube (AMT) drying cartridges to provide dehydration of the compressed air prior to separation. This innovative patented feature eliminates the need for a separate desiccant dryer – saving up to 20% purge loss, significantly reducing capital and installation costs and reducing overall pressure drop by 10 psig or more over traditional nitrogen generation systems. Traditional nitrogen generators often require purchasing installing and operating an external desiccant dryer. Without complete pre-treatment of the compressed air, a generator must be oversized to properly separate the nitrogen molecules from the compressed air. Even worse, poor quality compressed air can lead to contamination of the costly Carbon Molecular Sieve media. The innovative nano N2 nitrogen generators feature an integrated Adsorbent Media Tube (AMT) drying cartridge which eliminates the need for a pre-treatment dryer of any type. The integrated drying system reduces purge loss by approximately 20% and reduces pressure drop by 10 psi or more, providing significant energy savings over a traditional generator and improving ROI on the system.